Super kompleks przerzuciłem się z olimpowych i jestem zadowolony tak jak z większości produktów firmy Now Foods. One capsule fully covers the demand for vitamins, so there is no need of additional supplementation. 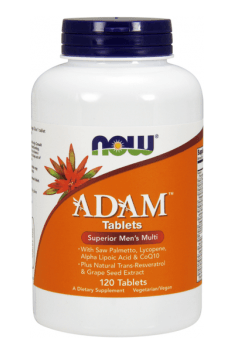 The supplement supports the proper functioning of the body system and helps to improve the life quality of men. It is recommended for physically active people and people whose diet does not contain products with high nutritional density. Because of the content of vitamins soluble in both fat and water, it is recommended to take the supplement with a meal. Store in a dry and cold place. Helps maintain healthy blood pressure and homocysteine metabolism. Inositol hexanicotinate (IHN), also known as inositol hexaniacinate, is the inositol esterified with niacin. IHN undergoes hydrolysis in the body, gradually releasing nicotinic acid and inositol. Such properties make this form not only very effective but also free of the side effect referred to as flush effect (redness mainly on the face, forearms and neck), which occurs in standard forms of niacin and is very unpleasant for many individuals. Inositol hexanicotinate is a component of niacin-based dietary supplements. It is suggested that inositol hexanicotinate is as effective as niacin alone (may contribute to lowering cholesterol levels). Because of decreased risk of such symptoms as skin redness, itching and tingling, it can be a perfect solution for persons who resign from traditional vitamin B3 supplements due to these unpleasant effects. Aloe vera (Aloe barbadensis Mill.) is a tropical and subtropical plant originating from Mediterranean countries, which finds application mainly in dermatology and cosmetology (topical effect) and oral application positively influences the functioning of the digestive system. The flesh of aloe leaves is mainly composed of water (96%), however, the remaining 4% is constituted by a concentrated dose of nutrients and substances with high biological activity. Aloe contains i.a. fiber, fatty acids, amino acids (including 7 exogenous amino acids), polysaccharides, glycoproteins, plant enzymes (including SOD - superoxide dismutase) as well as vitamins and mineral ingredients. The internal activity of aloe is mainly directed at regulating the work of the digestive system. Aloe has antibacterial and antifungal effect, supports the treatment of stomach ulcers, alleviates inflammations, facilitates the organism’s detoxification and positively influences microflora of the digestive system, stimulating the growth of probiotic bacteria. External activity of aloe - on skin - contributes to strengthening the barrier of epidermis and also facilitates repair processes in skin, counteracts infections, stimulates the production of new collagen fibers. Additionally, it has softening and shielding effect.